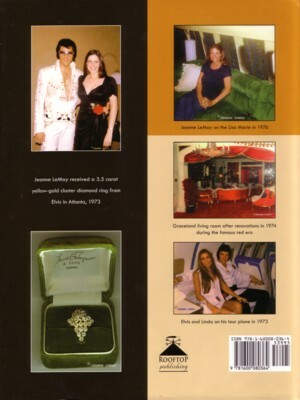 In late 2006 Jeanne LeMay Dumas self-published her fascinating book, "Elvis, Linda and Me". Jeanne is Linda Thompson's best friend, a friendship that started when Linda was Miss Tennessee and Jeanne was Miss Rhode Island. Jeanne shared many times with Linda and Elvis in the 1970s. In her book Jeanne recounts those times and publishes many rare photos she took at the time. In early 2007 "Elvis, Linda and Me" was picked up by Rooftop Publishing and released in both hardcover and softcover formats. Jeanne recently took time out to talk with EIN's Mandy Squair. EIN: Jeanne, it’s great to talk with you today. Jeanne: Thanks, it’s great to talk to you. EIN: Until recently few fans knew about your friendship with Elvis. It was almost like you were one of the Elvis world’s best kept secrets. Please tell us the Jeanne LeMay Dumas story. Jeanne: Wow, where do I begin? Like most people, I was a huge Elvis fan and never dreamed I’d get to meet him, much less have the experiences I ended up sharing with him and Linda. I’ve always in my heart felt it was fate, destiny, whatever you want to call it, that first brought me and Linda Thompson together as roommates at a beauty pageant in Puerto Rico. She was Miss Tennessee and I was Miss Rhode Island. We became instant friends & I ended up moving to Memphis after the pageant to live with Linda and from there, of course, as the old story goes, the rest is history. We happened to be in the right place at the right time and met Elvis at the Memphian Theater one night, and a romance quickly developed between Linda and Elvis. Linda then moved into Graceland to be with Elvis. As Linda’s best friend, I was privileged to be able to “go along for the ride.” And it was quite a ride! Not only was I able to remain close to Linda but I was also able to share her exciting life with Elvis, from traveling on tour with him to having sleepovers at Graceland on the rare occasions that Elvis was on the road without taking Linda along. Elvis then asked me to come to work for his dad, Vernon , in the back office at Graceland . Again, I couldn’t believe how the angels how smiled on me and how I had to be one of the luckiest people on earth. Elvis shared his famed generosity with me in many ways, including jewelry, watches, a new car, new clothes, and, most importantly, his amazing friendship. EIN: The beauty queen world is one most of us know very little about apart from televised shows like Miss Universe. What was it like being part of such an interesting and glamorous world? Jeanne: It was exciting, for sure, but, to be honest, it was also a lot of hard work. The rehearsals, the dance routines, the schedules, they all could be quite grueling at times. Linda, however, turned it into such an enjoyable experience that, for me, winning the crown became secondary to all the fun we were having together. EIN: What has the most important or lasting thing or you have taken from your time as Miss Rhode Island? Jeanne: It gave a previously shy girl from Rhode Island the confidence to go after things she never would have felt comfortable doing otherwise. EIN: And before writing “Elvis, Linda and Me” what occupied your life? Jeanne: A happy marriage with my husband Bob. EIN: What does Jeanne LeMay Dumas do today, apart from promoting “Elvis, Linda and Me”? Jeanne: Well, let’s see, I have a career in sales, travel with my husband, and stay busy maintaining our homes in Rhode Island and Florida. In addition, I enjoy spoiling my two dogs, Krystal and Sparkle. EIN: Please tell us about your friendship with Linda today. Jeanne: To my good fortune, Linda and I have remained good friends over the years. We talk on the phone and send cards to each other on special occasions. I just spoke to her yesterday, as a matter of fact. About five years ago I spent a week as her guest in her beautiful Malibu mansion. EIN: What was the genesis for your book, “Elvis, Linda and Me”? Well, that got me to thinking that maybe people would enjoy seeing the photos, but I wasn’t prepared at that time to commit to writing a book. So, instead, my husband put together a website where we displayed and sold some of the photos. The response was so overwhelming and positive, and the repeated suggestions that I write a book to go along with the photos became so numerous, that I decided to start putting my story together. The timing was perfect for an email I got from a great guy, Jim Cox, who lives in North Carolina, who was just finishing up co-writing an Elvis book, “Inside Graceland: Elvis’ Maid Remembers,” with Nancy Rooks. I asked him if he would be interested in helping me with my book and he enthusiastically agreed to do so as soon as he finished with Nancy ’s book. Over the course of the next year, “Elvis, Linda & Me” became a reality. EIN: For those fans who do not know much about “Elvis, Linda and Me” please tell us about it? Jeanne: Well, just as the name implies, it’s the story of Elvis, Linda, and yours truly. The story centers around my wonderful experiences with Elvis and Linda, as well as the pictures I had been privileged to take during those years. They ranged from candid photos of Elvis and his family & friends to pictures I took while staying at Graceland at various times. Linda had given me permission to take pictures throughout the house to send back to my family, and, at the time, I didn’t think much about it. Elvis knew about the pictures and had no problems with them, so I didn’t give it a second thought. After Elvis died, of course, the most mundane items related in any way to him became sought-after treasures. Pictures, of course, were like the Holy Grail. Over time I realized exactly how fortunate I had been to have been able to take the pictures I did. I saw in the movie “This Is Elvis” where EPE allowed the cameras to actually film the interior shots at Graceland , including the upstairs areas, and so I knew I wasn’t showing anything that hadn’t already been seen by the world. So, after the urging of so many fans to share my photos and experiences with them, that’s how the book came about. EIN: A highlight of “Elvis, Jeanne and Me” is its wonderful, very rare photographs? What are some of your personal favorites? Jeanne: Well, I have to tell you, they are all very special and dear to my heart, because they represent the magical time in my life I will never forget. As far as any personal favorites, though, I would have to put the one of the three of us, Elvis, Linda & me, at the top of the list. I guess closely behind that one would be the one of Elvis holding Lisa and the one of Elvis, Lisa and Linda together. I also can’t leave out the shot of me in the black dress Elvis had just bought me as well as the one of me sleeping in Elvis’ bed during a sleepover, which was taken with my camera by Linda without my knowing about it at the time. EIN: Many fans will be blown away to see the visuals of Elvis’ bedrooms at Graceland and LA. Only a few such photos have been published before. How long did you work on your book before publishing it? 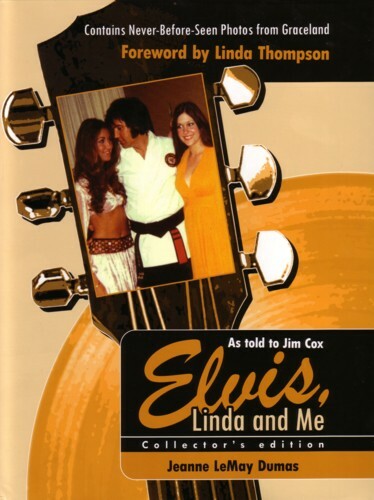 Back cover of "Elvis, Linda and Me"
Jeanne: Well, like I said earlier, the idea for it came during my visit with Linda in Malibu in 2002, and it was probably a year after that before I actually started putting things together for it. So, I’d probably say three years or so from beginning to end. EIN: Do you have more photos you haven’t published in the book? Jeanne: No other ones of Elvis (other than distant shots of him performing on stage) or interiors of Graceland, although I have quite a few other pictures taken on the road during tours, for example, and of friends and band members, that sort of thing. Other ones I took were of me and Linda, family and friends at Vernon ’s house on Dolan, that sort of thing. EIN: If yes, what plans, if any, do you have to release them? EIN: You originally released the book yourself. How did your subsequent arrangement with Rooftop Publishing come about? Jeanne: Another case of having the angels looking out for me I guess. Like you said, I originally paid for, self-published and released the book myself through Authorhouse. They did the initial design for it and printed it as a paperback, with 30 color pictures included. Within a few weeks, I got a call from Rooftop, which is the publishing arm for Authorhouse, wanting to take over the publishing for it, which I gratefully agreed to. EIN: Rooftop Publishing has released two editions of “Elvis, Linda and Me”. What are the differences between each edition? Jeanne: Once Rooftop took it over, they changed the cover a little bit, and put it out, initially, as a smaller 6” x 9” soft cover, and changed the 30 pictures to black & white to help hold down the cost. The story is exactly the same in all three editions, it’s just the number of pictures, and whether they are in black & white or color, that’s different. So, and I hate this for the fans, there may be some confusion, since there are now actually three different versions out there, although the original one from Authorhouse is only available on the secondary market. EIN: Jeanne, where is the best place for fans to buy your book? Jeanne: It’s available through all the usual internet locations, including RooftopPublishing.com, Borders.com, Barnes&Noble.com., Amazon.com. and the hardcover “Collector’s Edition,” which has the 70 color photos, should be available in bookstores soon. EIN: What was meeting Elvis like? Did he overwhelm you? Jeanne: That’s probably the understatement of the year! He totally overwhelmed and intimidated me, though in a very thrilling and exciting way. I was beside myself and kept saying, under my breath, “I’ve got to be dreaming, this isn’t really happening!” But, of course, thankfully it was. When he sat down next to Linda that first night at the Memphian Theater and eventually put his arm around her his hand brushed my shoulder and I literally thought I was going to die! It was an experience I’ll never forget. EIN: Right from their first meeting, Linda seemed to have just the right temperament and personality to complement Elvis. Her “Dracula” comment was one most women probably would have been too afraid to make. How well did they match as a couple? Jeanne: They were a great match. They shared the same sense of humor, upbringing and religious beliefs. When Elvis first sat down in the seat next to Linda and she asked, “To what do we owe the honor?”, she showed her sense of confidence which Elvis took an immediate liking to. Over time she also enjoyed sharing the baby talk with him, endearing him to her even more, and her nurturing ways reminded Elvis of his mother Gladys. Like I said, I think they were a perfect match. EIN: How similar are you and Linda in personality? EIN: What was Elvis like when at home at Graceland and LA? Jeanne: I guess it’s always a misconception that big stars are somehow different human beings than everyone else, but, in reality, they act just like we do when they’re at home. Elvis was no exception. He let his hair down and tried desperately to just be able to relax. He loved pulling pranks on his friends, watching TV, you know, the usual stuff. Like most people he had his good days as well as his bad, and he acted accordingly. EIN: How did his personality differ from when he was on the road? Jeanne: In the obvious ways, I guess. He was always under stress while on the road and I could often feel the tension in him right before he would go onstage. But, looking back on it, I’m still amazed that he was able to hold it together under the absolutely grueling schedule he sometimes faced. I don’t think a lot of people realize how difficult it was to be “on stage” for the long stretches he endured. EIN: You were one of the fortunate people to have seen Elvis live in concert. How many shows did you attend? Jeanne: To be honest with you, there were so many I don’t even remember. I stopped counting after a while. EIN: Have you seen an ‘Elvis in Concert’ show with Elvis on the big video screen and if yes, how does this compare to a real Elvis show? Jeanne: No, but I have heard that it is really quite spectacular, and I hope to be able to attend one soon. EIN: Much has been written about Elvis’ decline from the early 1970s. Obviously, his decline was a major reason in Linda leaving. 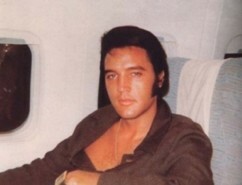 What changes did you notice in Elvis over those years? Jeanne: The most obvious thing to me was probably his change in weight near the end of the time I was with him. The very last time I actually saw him up close was in June, 1976, when he allowed me to fly with him and Linda on the Lisa Marie to my home in Rhode Island where he was to perform. I hadn’t seen him in several months and almost didn’t recognize him when we said our “hello’s” at Graceland before driving to the airport. I have to say, though, that even though he had gained so much weight, he never lost that gorgeous twinkle in his eyes or that handsome face. Everytime I looked at that face I marveled at what a beautiful man he was. Even that last time. It was amazing. I also have to say that I didn’t seem to notice any change in his overall temperament, either, though he was maybe a little more mellow than I had remembered. EIN: Could you have handled Elvis’ mood swings? Jeanne: Absolutely not! I was constantly amazed at how Linda was able to. I think that’s one of those things where her tremendous maternal instincts came into play. But, no, I couldn’t have handled it. I just remember the feeling I had, during many of those mood swings, of how utterly blessed I felt to be just part of it all, even though I felt like I was “on the sidelines” watching it all go on. EIN: Are you still friendly with Red and Pat West and Sonny and and Judy West? Jeanne: Unfortunately I have lost touch with them over the years. I look forward, though, to seeing Sonny and his wife again at some events in Memphis this August where we will both be participating. EIN: Judy West introduced you to “mulled” wine at Marty Lacker's New Year's Eve party 1973/74. Please tell us the story and exactly what “moll” wine is. 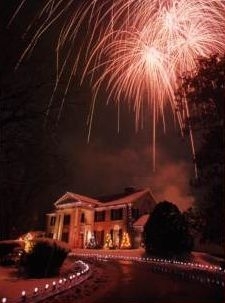 Jeanne: Elvis had decided that we would all go over to Marty’s house for New Year’s Eve. Once we got there, they brought out a spiced wine for everyone. It was delicious and I asked what it was and someone said “It’s mulled wine.” In any case, I enjoyed it, and was intrigued that I’d never heard of it before. I’m not sure but I think it may refer to a Christmas type drink. But, as I said, it was very good. EIN: Did you read the “bodyguard” book "Elvis, What Happened? ", and if yes, how did you feel about it? Jeanne: Yes, I read it when it first came out. Having known Sonny and Red I sort of feel like I know where they were coming from. I honestly believe their only purpose in writing it was to try and get Elvis to see what was really happening to himself and to nudge him into changing his ways. If they’d just been after the money, I think they would have accepted Elvis’ offer to pay them anything they asked for not to write it. Sonny has a new book out, “Elvis, Still Taking Care of Business,” and I certainly wish him the best success with it. EIN: We were surprised to read in ‘Elvis, Linda and Me’ that when Linda rang Elvis at Graceland from Los Angeles to ask about Ginger Alden, the bodyguards didn't put her through and evaded her questions. EIN thought that Linda got on very well with members of the Memphis Mafia, and they would have been sympathetic towards her when she rang. Why do you think the situation changed and how did Linda react to it? Jeanne: Linda got along very well with all of the guys, and they loved her dearly. You’ve got to realize that they were only doing what Elvis had told them to do, to keep him from an uncomfortable situation, and, as we all know, nobody said “no” to Elvis. I’m sure they thought they were just doing what they needed to do to protect Elvis, who didn’t want to talk to Linda because I’m pretty sure he knew what she would say to him. Her reaction was to write a letter, instead, which she eventually got to him. EIN: How did Elvis affect your life? That’s not to say that I don’t consider myself one of the luckiest and most fortunate people on earth to have known him and been exposed to his world. I’d be lying if I said that. As I look back over that experience, as I often do, I just want to thank my lucky stars for being a part of it all, and of watching my friend Linda grow, mature, and succeed with Elvis like she did. It’s truly been an unforgettable experience. EIN: Do you ever go back to Graceland , and if so, what is it like to go back now it is like a museum rather than a home? Jeanne: I have had one trip back since leaving Memphis in 1976. My husband, Bob, and I went back for a visit in 2003. We first visited Tupelo, which I’d never been to, and then drove to Memphis . There we met up with Jim Cox, my co-writer, who had flown in to take the tour with us, and the three of us took the tour together. I would be lying if I said I didn’t cry when we first pulled up to the front of the house on the tour bus (of course I’d also boo-hooed pretty badly at Elvis’ boyhood home in Tupelo). I can only say that at first I felt numb. It was almost surreal to go through the same house as a tourist that I’d practically lived in for several years in the seventies. The memories came flooding back, and I was overwhelmed with an unbelievable sadness. I wanted to go running upstairs, to turn the corner and head into Elvis and Linda’s bedroom, and yell, “Hi, I’m back!” Probably the strangest sensation, and the hardest to deal with, was to see that rope across the bottom of the stairway, preventing me from doing just that! It was an indescribable feeling. As if that wasn’t painful enough, I experienced a similar feeling when we made it back to Vernon ’s office in the backyard, a place I’d called home for several years. It was very tempting not to try and jump over that half wall, walk over to my desk, sit down in my old chair which is still there and start sorting fan mail again! Like all things nostalgic, it was a bittersweet experience. EIN: Jeanne, you are in Memphis during Elvis Week 2007. Apart from being special guest at Bill Burk’s Elvis World Luncheon, where will fans be able to meet you and buy your book? Jeanne: Well, of course, you know how things have a bad habit of changing before Elvis Week gets here, so let me tell you what is tentatively scheduled as of right now. I am scheduled to be at book signings at the following dates and times: August 11, 11am – 2pm Superior Restaurant, 159 Beale St., and 2:30 - 4:30pm Peabody Hotel, August 12, 11am – 1pm Peabody Hotel, August 14, Noon – 5pm Dolan Dr. House (Vernon Presley’s house around the corner from Graceland) and 6 – 8pm Days Inn on Brooks Rd., August 15, 9am – 11am Dolan Dr., There are probably going to be some other times and places but they haven’t been finalized yet. I really owe a debt of gratitude to my good friend Sandi Pichon, author of “Elvis ’75 Tour, Photos from the Heart,” for all of her encouragement. EIN: Will Linda be in Memphis for Elvis Week 2007? Jeanne: I spoke to her yesterday and she is still trying to work it into her schedule, but there is nothing definite yet. We are all keeping our fingers crossed that she can make it. EIN: What is next for Jeanne LeMay Dumas? Jeanne: Well, initially I look forward to meeting all the fans at Elvis Week coming up in August. We are also ironing out some possible book signings in the months ahead, and I look forward to that as well. EIN: Jeanne, thank you again for talking to EIN today. We wish you all the best for the future. Read EIN's review of "Elvis, Linda and Me"
Buy "Elvis, Linda and Me"
Teresa Melton: I absolutely loved the interview. I have been a good friend of Jeanne's for years, but I learned so much from this interview I never knew! We met at The Peabody Hotel in 2007 during Elvis Week. She knows I have been a huge Elvis fan all my life. I have read her book which I loved but I never wanted her to think I was her friend because of the Elvis connection, so I really don't think I have asked her a question about Elvis before. We have discussed him a few times but we had so many other things that drew us to each other. I found this really fascinating! For those of you who have not read her book, you have to get it. I have read over 200 books about Elvis but her book is a story that has never been told before. The pictures in the book are so great. No one has ever shown pictures of the upstairs before. Jeanne is such a beautiful person inside and out. She really spoke from her heart. I know why Elvis loved her, I do too! Where have all the Elvis fans gone?